Shirley Miller, 95, departed from this life to his heavenly home on July 27, 2015, from Salina, Kansas. Shirley Peter Miller was born Jan. 9, 1920, near Malta, Montana, the second child of Arnt and Cora (Anderson) Miller. Still very young, he moved with his family back to South Dakota, where they eventually settled along Highway 212 near Cedar Canyon. Joining Shirley and his older sister, Mazy, were his two younger brothers, Earl and Ronald. Shirley attended country grade school and enjoyed playing the violin in the school orchestra. He and Mazy boarded in Newell, South Dakota, for high school. He did well and enjoyed classes and after-school jobs, but he never finished high school, choosing rather to return home to help his family. He worked for several neighbors, herding sheep, cleaning barns, and doing a variety of other odd jobs. Early years for the Miller family were a struggle, farming with horses and milking cows. Eventually they purchased sheep of their own, and then were able to add more land and cattle. Family and the family business were always Shirley's top priorities. One of his big disappointments was not being able to serve his country because he did not pass the physical exam. In 1944, he met his sister's friend, Erma Gamble, a third grade teacher in Belle Fourche, South Dakota. He greatly appreciated and respected the love of the Lord that they shared. They were married June 15, 1947. For the first two years of their marriage, their home was a sheep wagon. When their first daughter, Della Rae, joined them, the big storage drawer became a crib. Before Reta Fae completed their family a few years later, they had begun combining and remodeling a couple shanties that would be their happy family home and continual building project in progress for their over 60 years of marriage. 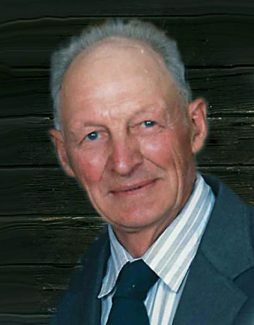 Shirley worked with his parents and brothers on their ranch near Mud Butte, South Dakota. He remained in a partnership with his brother, Ronald, for many years. As the two families worked together, Shirley was always looking for ways to "make things easier." Others involved sometimes mused about how much hard work it often took to accomplish a project to "make things easier!" Just one of those projects was moving in abandoned RR depots for ranch use. He often admitted that somehow more projects got started than finished. Shirley loved ranching and all the related challenges. He also desired to share his faith in Christ and enjoyed being a part of Prairie Home Church and Cedar Canyon Bible Camp. In later years, Shirley and Erma spent winter months in a camper in Kelly's yard in Kansas. They somehow enjoyed the cozy quarters, reminiscent of their sheep wagon home. Eventually, Shirley spent increasing time in Kansas, always interested in the crops, the livestock, and the latest project. Surviving family includes his daughter, Reta Fae Kelly and husband, Ken, at Ada, Kansas; son-in-law, Sam Mickelson and wife, Crystal, of Maurine, and also eight grandchildren and thirteen great-grandchildren: Travis Mickelson, wife, Haley, and children, Natalie, Tarrence, Makeltie, and Latham, Mud Butte, Fran Mickelson, Union Center, Tim Mickelson, wife, Courtney, and children, Toby, Soleil, Ciera, and Ruby, Maurine, Tyler Mickelson, wife, Jennifer, and son, Will, Mandan, North Dakota; Faye Lynn Stoddard, husband, Levi, and daughters, Reece, Sidney, and Paisley, La Junta, Colorado; Felicia Cammack, husband, Chris, Union Center, South Dakota; Kimberly McCosh, husband, Nathan, and daughter, Kassidy, Beverly, Kansas; and Ryan Kelly, Ada, Kansas. Other surviving family includes his brother, Ronald Miller, wife, Faith, Mud Butte, sisters-in-law, Anita Morris and Edith Nisick, Richland, Washington, and Darlene McNaughton, Ledyard, Connecticut; and many nieces and nephews. Preceding him in death were his parents; wife, Erma; sister, Mazy Weiss; brother, Earl Miller; and daughter, Della Rae Mickelson. Visitation was Friday from 9 a.m. until service time at Prairie Home Church. Funeral services were July 31, 2015, at 10 a.m. at Prairie Home Church at Maurine, with Pastor Roger Monson officiating. Burial will follow at Monument Hill Cemetery at Mud Butte, with Pastor Allen Menter officiating. The family suggests memorials to Prairie Home Church, Sunshine Bible Academy, or Cedar Canyon Bible Camp. Condolences may be sent to the family at http://www.kinkadefunerals.com.